The cold and flu season causes me to ask “Which is it—do I starve a cold and feed a fever, or feed a cold and starve a fever?” It’s an especially relevant question right now, since both my husband and I have been battling seriously nasty head colds this past week. With a little research I found the original saying was “Feed a cold, starve a fever.” But don’t you wonder where this advice came from and what the logic is behind it? Well, maxims typically date back many years, but “feed a cold, starve a fever” may beat them all. This saying has been traced to a 1574 dictionary by John Withals, which noted that “fasting is a great remedy of fever.” The belief is that eating food may help the body generate warmth during a “cold” and that avoiding food may help it cool down when overheated. Recent medical science, however, says this old belief is very wrong. And the good news is, starving is never the correct answer. So in other words, the advice we’re acquainted with to stay healthy (eat nutritionally-dense foods high in antioxidants, especially fresh fruits and vegetables), is the same we should follow to return to health when we get sick. So let’s talk about one food in particular that folks turn to when sick. Chicken soup. 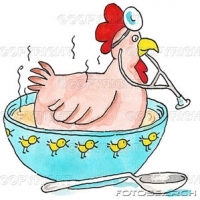 “Chicken soup” also happens to be part of the historical health advice that “Feed a cold, starve a fever” belongs to. Turns out, though, there’s sound truth to this maxim. 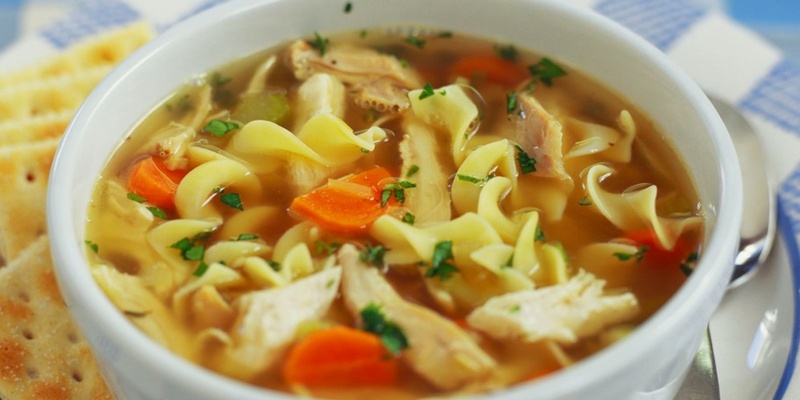 While science has shown there's no cure for the common cold, scientific research has also shown that when you're sick, chicken soup can help you feel better. Warm liquids, such as chicken soup, tea or warm apple juice, help speed up the movement of mucus through the nose. This relieves congestion and limits the amount of time viruses are in contact with the lining of your nose. Plus, soup and other liquids help prevent dehydration. I can vouch for this. 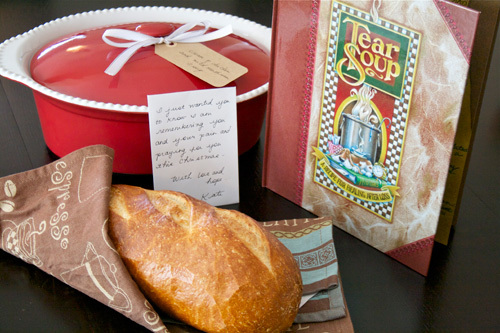 Yesterday a dear friend and neighbor, Christy, brought us a pot of her homemade chicken soup and some warm dinner rolls. We needed this on many levels. Rich and I gratefully had big bowls of this delicious elixir, and we both noticed that it wasn’t too long before we actually did feel better. As I returned to the couch to continue resting, I made a mental note that when I am back to my healthy self, I’m gonna follow Christy’s example and minister to the “sick and afflicted” with a pot of chicken soup. I just know that not only did her scrumptious soup help me feel better, so did her act of caring. So all this said, and if you can relate, then how about a recipe for a wonderful, health-promoting chicken soup? Let’s feed a cold AND feed a fever. Even if you already have one you love, add this to your repertoire and give it a try. Turn to it when you’re under the weather, and turn to it when someone you know and care about is under the weather. 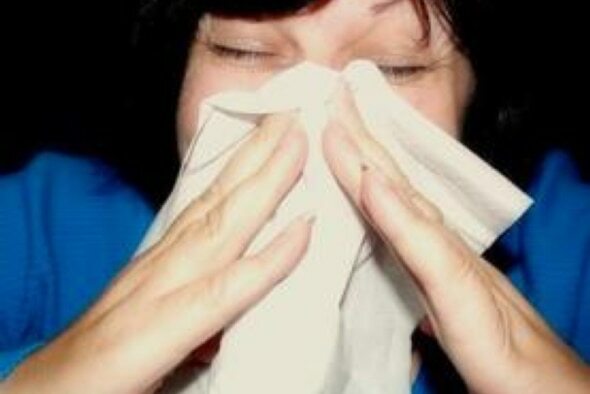 Everybody will feel better when you follow this tasty advice for the cold and flu season! 1. Heat olive oil in a large stock pot. Add onion, carrot, celery, garlic, thyme and bay leaves. Let the vegetables soften 8-10 minutes on medium/high heat. 2. Add a good pinch of salt and black pepper. Stir occasionally. 3. After vegetables have softened a bit, remove bay leaf and thyme. 4. Add 8 cups chicken stock and bring to a boil. 5. Reduce heat and add noodles. Cook noodles for about 5-6 minutes until softened. Add in chicken, stir; cook an addition 2-3 minutes. 6. Add salt and pepper to taste. Add a pinch of fresh parsley before serving.